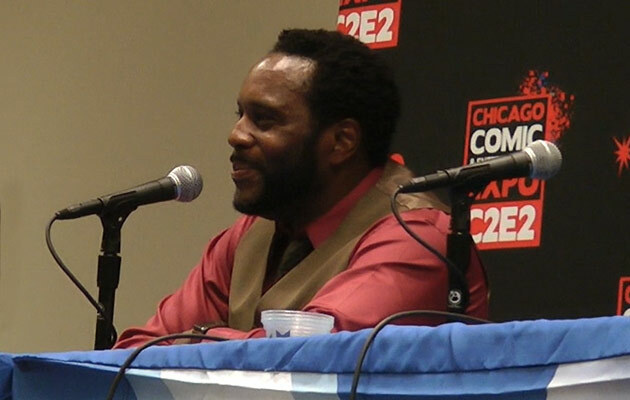 Dan Mahoney of panelsonpages.com moderated the Zombie Talk with Chad Coleman panel on Saturday, April 27, 2013 at C2E2. In addition to playing the role of Tyreese on The Walking Dead, Coleman is known for his starring role on HBO’s The Wire, his voice work as Coach in the video game, Left 4 Dead 2 and his performance as Herald Loomis in the Broadway production of Joe Turner’s Come and Gone. This panel followed the audience Q&A format, in which members of the audience are invited to form a line and ask their questions at a mic set up in the center of the room. Are the writers going to keep Tyreese’s character more strictly to the comic interpretation, or are they going to mix it up? Do you ever see any of the actors whose characters have died on the show? Who’s your favorite character in the entire series? How does your character feel about having been kicked out of both the Governor’s and Rick’s groups? Will we see Tyreese and Rick clash? What are some of your favorite or most emotional stories involving the cast? At what point after joining the Governor’s group do you think Tyreese decided Woodbury was not all that it appeared to be? Do you think Carl did the right thing in shooting that teenager? In what branch of the military did you serve?